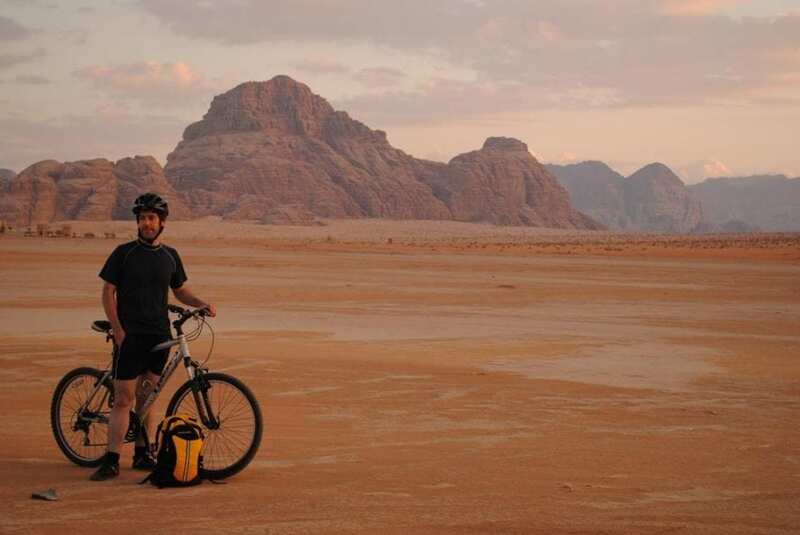 Combine a cycling tour with the Kingdom of Jordan and you end up with one unique holiday adventure. Travel to Jordan and bike through olive groves, hill top villages, and desert roads over the course of nine days. The communities here are nomadic and the landscape is vast. Top it all off with a float in the Dead Sea and a visit to the ancient site of Petra for one magnificent journey. First up is a visit to Jerash with its wonderful olive groves. You’ll also ride to Mt Nebo which ends in a thrilling descent to the Dead Sea. The adventure also includes a two day stop at Petra and a ride to Aqaba on the Red Sea to visit the beach. There are five days of cycling and you’ll average around 45 kilometres per day. The trip is 100% vehicle supported so you can focus on your ride and enjoying this beautiful country. Cycling is primarily on tarmac roads in good repair. There are several great descents and ascents, one of which is quite long. You don’t need to be a pro cycler to enjoy Wadi Rum, but a moderate level of fitness will greatly help you. All breakfast, 2 lunches and 1 dinner in Wadi Rum are included.Whilst staying in hotels we usually eat in local restaurants and on some occasions the leader will take those who wish, to a restaurant for a ‘mezze’ style meal. A mezze meal is made up of lots of small dishes which are eaten as a starter before a larger main course. It is a great way to taste lots of different foods from the area in one sitting. These allow fast service and a good quality of food for the group and usually cost 10-15 JOD pp. Allow about £190-230 (approx. US$300-370) to cover these meals. If you are vegetarian, please note that main meals are limited in choice; however mezze is almost always available in restaurants and is a good, filling option. There is also a good choice of seafood available when at the Red Sea. Meals are nearly always served with bread or in wraps so we recommend bringing some of your own snacks if your diet is more limited.